The Samahang Operasyon Sagip (SOS) immediately convened after the onslaught of Super Typhoon with the aim to bring immediate food relief and medical assistance to survivors. Volunteer doctors, nurses and other health workers were tapped to attend to their medical and food needs. Forty-five volunteer Health Science students from different schools and community health workers from Quezon City, Pasig City and Paranaque City helped the more than 1,500 relief packs for the affected families in Eastern Samar and Western Samar provinces. 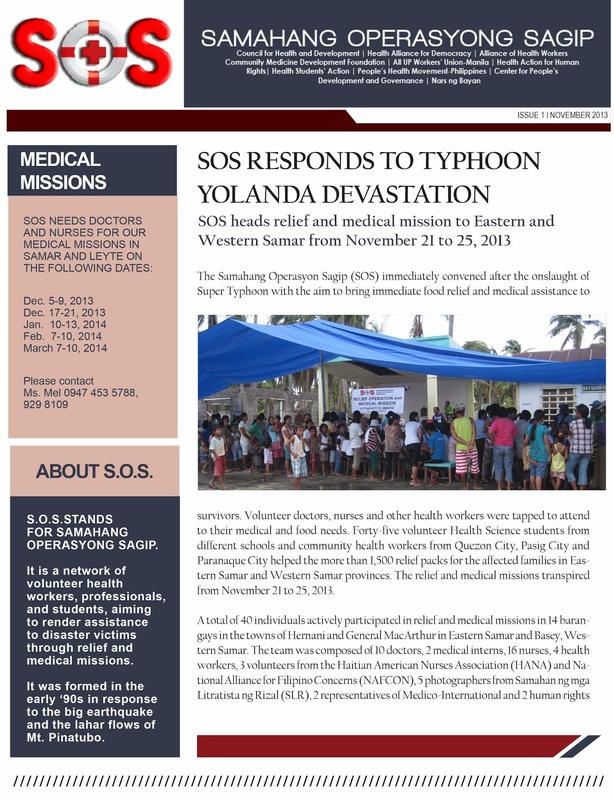 The relief and medical missions transpired from November 21 to 25, 2013. A total of 40 individuals actively participated in the relief and medical missions in 14 barangays in the towns of Hernani and General MacArthur in Eastern Samar and Basey, Western Samar. The team was composed of 10 doctors, 2 medical interns, 16 nurses, 4 health workers, 3 volunteers from the Haitian American Nurses Association (HANA) and National Alliance for Filipino Concerns (NAFCON), five photographers from the Samahan ng mga Litratista ng Rizal (SLR), 2 representatives of Medico-International and 2 human rights workers. A total of 1,088 patients were served while 1,664 families were given relief packages. Table 1 in page 2 shows a detailed account of survivors reached by the missions. The medical mission team found the affected community members to be suffering from colds and cough, upper respiratory tract infections, hypertension, arthritis, error of refraction, diarrhea, lower and muculo back pain, skin diseases and injuries. There were also a number of obstetrics cases and pulmonary tuberculosis suspects. The present situation in the visited areas of Eastern and Western Samar is disturbing. In Hernani town, almost 80 percent of houses were damaged, with more than 200 families in Barangay Batang living in make-shift tents. Typhoon Yolanda inflicted serious economic dislocation to the affected families. Fishing, which is the main source of livelihood were crippled as Typhoon Yolanda either destroyed or swept away fishing boats. Coconut trees were uprooted or snapped; hectares upon hectares of rice and root crops were destroyed. The devastation caused by Typhoon Yolanda once again showed the vulnerability of the people, especially the poor segment of the country’s population to disasters. Amidst the suffering of millions of people who lost their homes, their loved ones and their livelihood, the Samahang Operasyong Sagip (SOS) calls on the people to contribute their resources to the victims of Typhoon Yolanda. 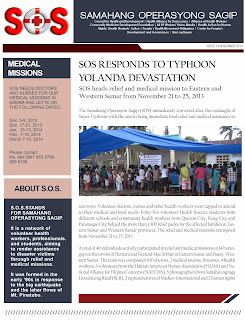 SOS also calls on doctors, nurses and health professionals to lend their talent, time and resources to help alleviate the suffering of our fellow countrymen. 1. Lift the December deadline set by the Department of Social Work and Development for food relief assistance. Ensure swift and far-reaching food and non-food relief provision to all Yolanda-affected population. • malnutrition problem especially among children which will be further worsen by Typhoon Yolanda. • attend to the mental health and wellness of the community.